My friends over at Social Media Examiner just released their 2014 Social Media Marketing Industry Report. It’s a survey of 2,800 marketers from around the world, asking about their attitudes and plans for social media usage. This is the 6th annual version of this report, and I recommend you grab yourself a copy right here. It’s not perfect research because the participants are self-selected and are primarily small business (65% are in companies with 25 or fewer employees). However, the non-USA participation is very nice (40%) and there’s definitely a good smattering of participants who have been doing social media professionally for several years. This was the #1 tactic that marketers said they wanted to do more of, which is staggering given blogging’s maturity. Not asked was whether that increase would be via owned blogs, or on third-party thought aggregators like Medium and Linkedin. Evidently – at least according to this survey – blogging is far from over. It’s been reported that 100 hours of YouTube video is uploaded every single minute. Approximately 50% of that video is about squirrels, so take that stat with a dose of skepticism. But there is no doubt that the video train is nowhere close to slowing. Further, with the rise of LTE and the corresponding ability to stream video anywhere, coupled with the increasing usage of Vine and Instagram video, being able to communicate cleanly and clearly via video is a major area of focus – and should be. This makes perfect sense to me, as I intersect with marketers constantly who have overlooked Linkedin for years and are just awakening to its power as a communication and content platform. Very bullish on Linkedin am I, especially because they have done a nice job of keeping it nonsense-free for the most part. Only 6% of respondents currently use podcasting, so 21% of these survey takers saying they want to do more of it is a large bump. In the marketing and social marketing world this trend has already fully taken root, as you can’t swing an old Pets.com sock puppet without hitting a new marketing podcast. I’ve been doing Social Pros for about 27 months, and I feel like a grizzled podcasting veteran. (if you haven’t listened to the show, give it a shot. I guarantee you’ll learn a TON from our guests). The social media usage of experienced marketers versus less experienced marketers is quite different. Among marketers with 5 or more years of experience 71% use blogs, 74% use Youtube, 76% use Linkedin, and 15% use podcasts. Among marketers with 1 to 2 years of experience 48% use blogs, 50% use Youtube, 70% use Linkedin, and 4% use podcasts. Looking at the first five statistics I’ve cited, I see a trend that is reflected in the work we do at Convince & Convert and the questions we are asked by our clients. Social media marketing is converging with content marketing, as experienced short-form social content participants seek the persuasive power and extended shelf-life of longer-form executions like videos, blogging, podcasts, infographics, Slideshare and similar. Note that this ties into the Linkedin finding as well, as that platform has pivoted nicely to become THE content marketing and amplification platform for business. It’s not a social network, it’s a content network with a comments layer. In our company, we describe this difference between small and big social/content as “bricks and feathers.” Feathers are the disposable flotsam and jetsam of social communication, and the stuff you see on Facebook, Instagram et al. Bricks are more sturdy content initiatives with higher production values such as white papers, webinars, research reports like the one I’ve examined here, and so forth. You need both bricks and feathers to succeed in modern marketing, but with the exploding volume of feathers and Facebook’s Reachpocalypse engagement rate decline, putting more effort into bricks is starting to feel like a pretty smart play, especially if you’re trying to map all of your communication efforts to consumer behavior and purchase funnel stages (which you should be doing). This is an increase from 28% last year, but is still remarkably low. Given that as much as half of website traffic to blogs can come from mobile users, to not have a mobile-optimized blog at this point is incredibly short-sighted. If the blog is on WordPress, adding a decent mobile optimization plug-in is a minor thing. The best scenario, however, is to build the blog with mobile in mind, as we did when we re-launched this blog recently. Our mobile ratio here is only 15% because so much of our traffic comes from Google organic search via desktop, but we still massively prioritized mobile, and so should all marketers. (here’s some details on how we did it, and why). It breaks my heart that this is still the number one reason why marketers defend their social media participation. The problem with this metric is the assumption that “exposure” is innately of value. Much of the exposure generated in social media isn’t net new exposure, but rather additional exposure to people who already know you. How often do you follow companies in social media that you’ve NEVER heard of? Put another way, research from DDB found that 84% of fans of business Facebook pages were current or former customers of those businesses. So is this exposure actually reaching new people, or is it just preaching to the choir? Website traffic is a frequent companion of the awareness metric, and they are similar in their shortcoming and vagaries. A challenge is that most “classic” social media in the feathers category like Facebook, Twitter, et al aren’t particularly good ways to drive traffic. It’s possible, of course, but the ratios aren’t spectacular. In most cases (your mileage may vary) if you look at your website analytics you’ll find that social media’s contribution to overall traffic pales in comparison to search, direct URL entry, email, and sometimes even other referred traffic. 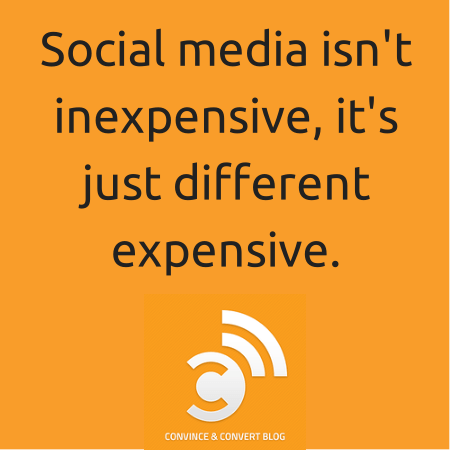 I’d argue that we’re pretty good at social media here at Convince & Convert, yet social accounts for 11% of our traffic. Also, “traffic” has no inherent value whatsoever. Someone visiting your website gets you nothing, unless that person comes back and/or engages in a behavior that does produce revenue or puts them on a path to revenue, etc. This is why it’s so critical to set up goals in your analytics and then measure whether your social media-referred traffic is converting, and if so, whether they are converting at a ratio disproportionate to traffic from other sources. For us, social is 11% of the traffic, but 17% of the goal completions. If you’re going to put a lot of eggs in the social media basket – as we do, and as the participants in this survey do – you need to understand what it’s really doing for you, and what it would cost you to replace that website traffic/goals/conversions from another source. Now this is a success metric I can embrace. Because much of your social media interaction with brands is with brands that you ALREADY know and love (see above), I believe that social media is much more of a natural loyalty and advocacy play than it is an awareness and sales play. Again, I’m speaking here about Facebook, Twitter et al where you typically see communication from companies you choose to follow. Using social similar to how email is often utilized – to keep your business top-of-mind among people who are already inclined to support you – is a very reasonable game plan. The only problem I have with loyalty as a success metric is that very few companies actually measure that loyalty to determine the impact of social media on lifetime customer value, propensity to promote the brand, etc. They just presume that interacting with customers in social creates loyalty that pays off at some point. While that may be true, it’s a lot easier to rightsize your social resources when you have mathematical and financial proof of that impact. There are many more interesting stats in the full report. Go grab it.